18:43 Cops retire behind the safe barrier tape. Cheers from the occupation in Lorien. 18:41 Police encircles a sit-in on the lane to Lorien. So far, no eviction, cops do not have helmets on. Situation calm. 18:37 Lanes to Lorien continue to be “liberated” from tree trunks and other barricades. All three tripods evicted. Sitting blockade (about 20-30 people) is still sitting. Police approaching. 18:20 5 people in the circle lock on tree house Jelka sing “Der Traum fängt an!” (The Dream Begins, variation after Ton Steine Scherben) while around them SEK is fiddling about. 16:30 Last person is being removed from the Punkpod with massive police violence. 16:23 One person unsecured in the last tripod. Path towards the treehouse “Deer” is in progress. Several detained. 16:10 In Kleingartenverein the police is on Jelka, five people are in the lock-on, singing Ton Steine Scherben. In Lorien the tripod “Punkpod” is still occupied. 16:00 Kleingartenverein: 6 people detained. One for playing the flute, four for being on tripods, and one from the tree-house Dialektik. Dialektik has been cut to the ground, and now is lying there smashed to pieces. 15:17 Kleingartenverein: 3 people evicted from the small tripod, 1 currently being evicted at the big tripod. Cherry-picker at the treehouse Dialektik. 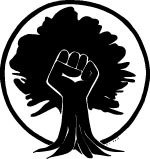 Activists are in the tree-crowns, tree-houses and traverses. 15:00 The encircled people are dancing to music made by a bagpipe band, while a harvester is driving up to destroy what is left of the Punkpod. 14:30 20 people already evicted from Miketown. Encircled and waiting for further treatment. 13:35 Police is cutting ropes in Lorien, despite warnings that people are connected to them. Again police brings people in dangerous situations! 13:32 Police is evicting tripods and beating their way through sitting-blockades. No press or parliamentarian observers present. 12:50 In Lorien, the first person is taken from the tree. 12:41 Eviction in Kleingartenverein is in progress. Police are destroying soil structures. 16:23 One person unsecured in the last tripod. Path towards the treehouse Der is in progress. Several detained. 14:30 20 people already evicted from Miketown. Encircled and waiting for being identified. 11:45 Police are escalating in Kleingartenverein and dragging activists through the mud. Families with children affected. Press not on site, but urgently desired. 11:46 Cherry picker in the forest, is driven up to platform near the entrance of Punkpod. 11:30 The cops admire four fat concrete blocks under the Hambach Railway, two V-shaped lock-ons under the rails and a large concrete barrel that was also parked there. That’s going to take time. 10:48 Police remove first barricade at Punkpod. There is still a sitting blockade and tripods. 10:35 Also in Lorien at the Punkpod an eviction order was read out. 10:30 In Kleingartenverein (allotment garden association), the eviction notice is read out and the area is closed off with barrier tape. 10:00 The private mine railway Hambachbahn is being blocked! More information will follow. 17:05 Police are cutting barricades by chainsaws and trying to block Beechtown. Enduring forest walkers are still jumping around loudly. 16:37 Beechtown is surrounded by about 200+ cops. 15:37 Police starts in T-Town eviction of a barricade. Shortly after that it is dismantled. Now they move towards Beech Town. 15:31 The one who registered the forest walk says that about 7500 people attended the standing demonstration. After several talks with the police they were allowed to walk to #Morschenich and from there they went into the forest. 15:30 At the Punkpod the evacuation of the barricades is beginning too. Encirclement in Cozy and Beechtown. Support urgently needed. 15:10 Police hundreds are standing at Beechtown while people commemorate the deceased. 14:45 After the use of pepper spray, several police units formed chains on the forest trails near Beechtown, remove barricades. Other officers follow quickly the people scattering in the forest. 14:37 Approximately 30 vans on their way on the L 275 direction Secu road, some already in the forest. 14:30 Many police troops concentrating towards Beechtown. Pepper spray use. 14:20 20 vans on the way over Secu road into the forest. 14:10 More than 700 people between Lorien and Punkpod! 14:00 Police let people pass without controls into the forest, construction of barricades in Beechtown and Lorien. 13:50 The demonstrators are pushing the police out of the forest. 13:50 The police going in groups deeper into the forest. Activists answer to that with loud yells “piss off!”. 13:35 With applause from the surrounding people, +20 people lifted a 15m long tree trunk onto the barricade. 13:30 Barricades are being built. Police are in the immediate vicinity and restrain themselves. 12:22 Among the demonstrators who reached meanwhile the forest by the fields, many older people and families with children. 12:41 A car that was parked on the side of the road L257, at the vigil, is being towed. 11:55 Already thousands of people in front of the forest near the vigil. 11:48 Several hundred participants now joined the alternative route into the forest and are surrounding the police checks. 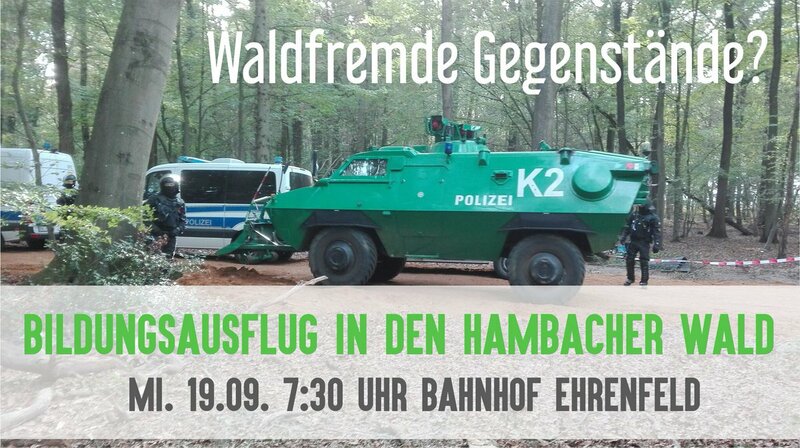 11:25 Anyone who wants to go to the #HambacherForst can do so, but has to identify themselves and will be searched. 11:00 Again failure of the suburb train S-Bahn from Cologne to Buir. 10:55 Currently police do not let anyone through from the vigil to the gravel pit. The reason is unclear. The one who registered the forest walk and police discussing. 10:50 At the vigil several hundred participants. There is live music. 15:38 Lorien: A person who wanted to contact the police is arrested. 15:07 Also on the way to the Hambicamp (in Manheim at the bus stop) there are bag checks by the police. 14:38 200 people at a spontaneous forest walk in Beechtown, several hundred in Lorien. 13:34 A hundertschaft surrounding Beechtown. 13:17 The hundertschaft is going back towards the already deforested strip near the open pit. 13:10 A hundertschaft (about hundred police officers) stands in front of a barricade near Lorien. One of them takes pictures. 08:00 Police inspect people near gravel pit. Bags and ID. Some people are admitted to the forest with the words “if you leave us alone”. 19:37 Police again in front of Lorien. On the question what they are doing, they answer that they do not know that themselves. 17:26 The police are leaving Lorien. 17:02 Since more than 30 minutes activists have been singing in Lorien. The atmosphere is very peaceful, also families and children are in the forest. Police standing still quite at a loss around the monopod. 16:00 2 troops of climbing cops in Lorien seeking strategy for the tree house eviction. 14:24 Climbing cops arrive in Lorien. 14:20 RWE preparing the road to the monopod in Lorien. 13:12 Police are now advancing to the two tripods on the edge of the forest. So far they are only standing about there. Several activists sitting under the tripod, singing. 12:58 Lorien: Climbing police & RWE are on their way to monopod. Will probably be evicted soon. 12:28 Hundreds of police prevent people from entering the forest. 12:15 Convoy of three ambulances and two emergency doctors with flashing blue lights on the way to the forest. 12:12 The harvester has been retreated, there is now more press present. The monopod is still shaking. 11:50 A harvester is working close to a tripod with a person hanging in a traverse. 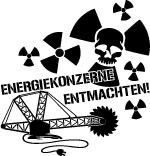 RWE putting more lifes in danger! 11:30 Police is pushing and beating people off the blockade towards Punkpod and into the forest. People screaming. 11:24 Other hundreds of cops arrive, assisted by mounted police. 11:19 Police push and beat the blockade. A lot of shouting. 10:35 Another hundred of cops arrive at Lorien. 10:30 Sitting blockade near Lorien is being violently evicted by the police. 08:00 There is a weather change. Strong wind, rain and a considerable cooling have been forecasted. Now we need your support. Sleeping bags, tarps, jackets in order to continue being resistant. 18:22 In front of the tree house Lump in Cozytown, a lighting system is being set up again. 17:30 Meanwhile, a van is standing under the tree house Lump (Cosytown). 17:30 From the Buir station, people are streaming towards the forest. 17:18 We just got the information that the police in Beechtown said they would arrest everyone with a climbing harness. 16:00 At Lorien, barricades are removed, allegedly for “escape routes”, although police block all escape routes with their vehicles. 15:45 Police acts again violently against peaceful people in the forest. 15:34 People on the ground are being chased and arrested by police at Beechtown. No “rest for 24 hours”. 15:31 Allegedly, 3 parliamentary observers negotiated with the police at Lorien. They’re retreating now. 15:08 Sit-in and police cordon face each others in front of Lorien. 15:00 About 40 people in a sit-in, police tanks moved away. Police removes barricades, puts on helmets. 14:49 Barricades in Lorien are removed, despite the “day of rest”. 14:42 Two activists are carried away by police. 13:44 People are controlled when entering the forest. 13:31 People bring flowers and candles to the place where the person died yesterday. 09:45 Minister of the Interior Herbert Reul (CDU) urges the tree occupiers to leave the trees voluntarily. 00:12 Attorney Mertens does not get permission to go to Beechtown. 23:30 10 persons are still in GeSa Aachen. 21:53 According to info from EA, the legal team, NOT all will get out – contrary to the announcement of the police. 20:20 The police continues to control people on their way to the meadow. Sleeping bags and sleeping pads were seized. 16:45 The police say, the person is alive and was brought away by rescue helicopter. 16:10 Situation uncertain. At the time of the accident there was at first a tumult, now a great silence and sadness. 15:46 In Beechtown, a person fell from a traverse (rope between two cabins). 14.20 Two more arrests, respectively in Cozytown and Beechtown. 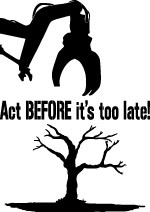 Repeated calls from activists who remain in the trees: «¡HambiBleibt!», ¡Hambi permanecerá!. 13:36 La cabin Bambule is evicted, the last person is forcibly removed from the tree top. 13:10 Cries from Cozytown, against one of the locked on people the police are currently using force. 13:02 In Cozytown, all eviction work was stopped. 12:59 In Malacadonia, the lock-on is being processed. 12:55 ATTENTION, POLICE! Under cabin Lump, in the “barrio” of Cozy Town, there is a tunnel. Moving heavy machinery in the area endangers human lives! 12:20 Arrest in Cozytown. The paramedics were called. However, it seems that the activist is fine. 12:03 On the outskirts of Beech Town, people accompany the expulsion with classical music. 11:35 In Beech Town, the dismantling of a cabin by the police has begun. The activists hang from traverses outside the houses. 11:35 Sitting in front of Coytown expelled. Cut from the hallway to Lump almost finished. 11:30 SEK is now on the cabin Malacadonia. 11:06 Evictiion in Cosytown too. Cherry picker installed. 10:58 Crane goes down again. 10:55 Crane goes up to Beechtown, there are cops with shields. 10:24 Cranes and cherry pickers in Beechtown. Evacuation is in preparation. 10:11 SEK, climbing police and RWE workers inspect Beechtown. Seems that soon their job will start here. 10:10 A finger (a section) of AktionUnterholz arrived at the vigil. 9:50 In Kleingartenverein and in Lorien, there is a lot of police but no press. 8:37 La prairie est bouclée par la police en direction de la forêt. 8:30 Fifty people from Aktion Unterholz were surrounded in the fields south of Lorien. Twenty others make a sit-in in front of Lump in Cozytown. The eviction forces are on site, the eviction notice has been read. 8:00 Now, there are about three or four hundred cops at the airfield. 7:58 2 WaWes (Water cannons, in the language of the German police called WaWe), 1 eviction tank and one hundred cops at Secustraße. hundred cops heading for the meadow. 7:45 At the sit-in, the mood is good, they sing. Invitation to an educational event of AktionUnterholz. They are looking for objects strange to the forest. 21:00 Correction: There are still people in the lock-on in Whydah! 20:50 Whydah and Nonames are completely evicted: the last people were taken away with the prisoner transporter. 20:44 There are no more works in Cozytown or Beechtown. However, the spotlight is aimed at Beechtown. Police standing next to it, looking a bit stupid. 20:40 In Punkpod, there is now a spontaneous piano concert. 20:10 Expulsion of Whydah (last tree house in Gallien) is still in progress. 17:26 It is official! Tomorrow (19.09. 10:00) the HambiCamp in Manheim starts! Further info will follow! 16:50 Police president Weinspach inspects Cosytown und Beechtown. Howling can be heard from the trees. 16:34 Nonames: Chainsaw can be heard. The person on the roof is being evicted first. 16:30 Police starts fire on a field, and extinguishes it with their Water-cannon. “Fire-safety”???! 16:10 Nonames: “You are destroying the future of all of us. It’s not just about this tree!” Police doesn’t care. 15:40 Eviction of Nonames begins. The two activists in the tree are ready. 15:24 Cherry picker preparing at Nonames, no eviction notice has been read out loud. Police and RWE want to cut monopod in Lorien, on which a human life is hanging. Camera people please come. 14:45 Police are making it loud and clear, that only members of parliaments and press are allowed in the forest14:32 Punkpot is being protected by wild boars! 13:48 Chillum is being evicted, Orca and Bolo are being taken apart, cherry picker orange and red, plus big white crane. Traverses in front of nonames are being cut, person seems to be secured in a further traverse. Lorien seems to be calm again. Randale evicted. 0:50 In cosytown eviction is going on. 3 persons on Casa Durruti still locked on, Cops are using angle grinders. « Forest-walk this Sunday (23rd September), or any day! Heartfelt thoughts for you al at this time … Forests let alone ancient Forests are such beautiful healing places for all living souls in so many ways … A place and home for many animals and critters and a space for us Humans to deeply connect with Mother Nature and reflect and renew our purposes in life with a purity of spirit and knowledge to continue our journeys with an awareness and consideration of the consequences and vision of our work for a better life for all . In short Forests are Sacred places . What an Ugle Inhumane Opperation the Germany Police have Shown they can be . Shame on the Ignorance of Mrs Merkle and her thugs. 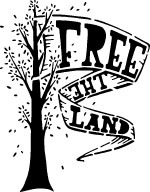 Bless everyone of you for your Braveness and for standing up for this Sacred Forest . You are all my Heros . Defenders of Humanity and Intelligence . Peace and Love Always . 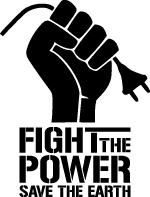 Support the many people and groups that stand up and fight for Mother Earth and all the Relations.